I love movies and have for my entire life. Unfortunately, the film industry's obsession with comic book-themed films that are obscenely over budget (and not interesting) are the overwhelming product that are made these days. I have always loved independent films. They aren't very prolific these days. So I don't see movies very often. Tonight was an exception. We watched two movies that were pay per view on tv. They were good in different ways. But I feel satisfied, which is rare, with our movie viewing experience tonight. 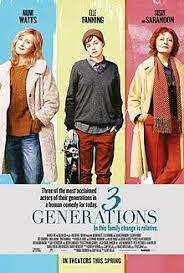 3 Generations--Naomi Watts, Susan Sarandon, Elle Fanning and others. "After Ray [Elle Fanning} decides to transition from female to male, Ray's mother, Maggie [Naomi Watts], must come to terms with the decision while tracking down Ray's biological father to get his legal consent." Sarandon plays the mother to Naomi Watts and grandmother to Elle Fanning. 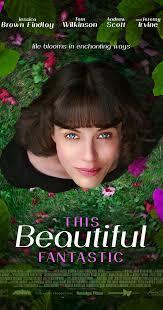 This Beautiful Fantastic--Starring most notably Tom Wilkinson and Anna Chancellor (she played "Duckface" in 4 Weddings and a Funeral). "A young woman who dreams of being a children's author makes an unlikely friendship with a cantankerous, rich old widower." My nominee for the SEXIEST MAN.